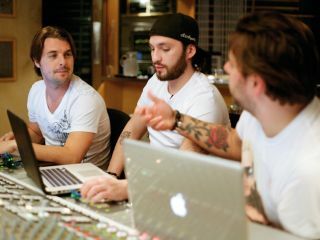 Swedish House Mafia: (from left to right) Axwell, Steve Angello and Sebastian Ingrosso. Swedish House Mafia's One (Your Name), which features a vocal contribution from Pharrell Williams, is shaping up to be one of the biggest dance anthems of the summer, and our sister magazine Future Music recently got an exclusive insight into the production of the track. Discussing Pharrell's vocal, Mafia man Steve Angello says: "We had a Pharrell a cappella that me and Seb [Ingrosso, fellow SHM member] had recorded in Australia for another track that we wanted to do over a year ago. We took that and tried it on One and it worked. Well, it worked after Axwell [third Mafia man] Melodyne'd the crap out of it!" "We had one phrase that we had from Pharrell and we made it into a whole song," explains Axwell, with Angello adding that "it's kind of old skool, chopping up one vocal and turning it into a whole dance track." The video for One (Your Name), which you can watch above, is noteworthy for its prominent use of Teenage Engineering's forthcoming OP-1, which should raise the profile of this synth/sampler/controller - not to mention the anticipation level ahead of its release - considerably. For a massive In The Studio feature with Swedish House Mafia, check out the August issue of Future Music (FM229) which is on sale now.